This document provides a presentation of early success stories of SlapOS as of June 7th 2001. SlapOS success stories were first introduced at the OSCi workshop of the Compatible ONE collaborative research project to an audience of consisting of representatives of companies such as Bull, Intel, Alcatel Lucent, Thales, Orange, Nuxeo, Xwiki, Nexedi, Activeon, eNovance, Mandriva and VIFIB. Success stories were then announced officially during FISL, the largest open source conference worldwide, organized in Porto Alegre (Brazil). 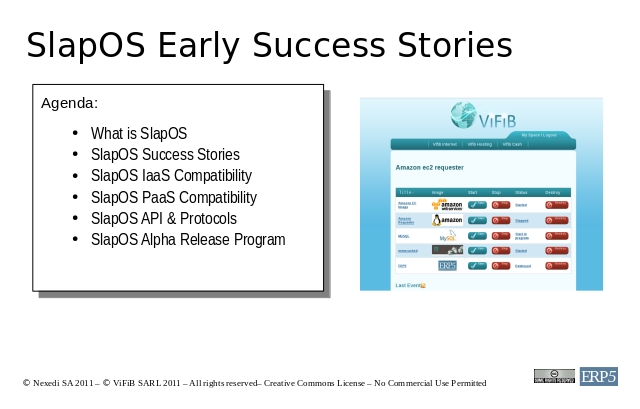 SlapOS early success stories provide an overview of the future of Open Source Cloud Computing. This presentation highlights in particular how SlapOS can perfectly complement privaote Cloud implementations including VMWare and increase productivity for Enterprise information systems. This presentation provides a simple description of SlapOS from a user perspective. A list of success stories is then provided in the field of aerospace, banking, transportation and IT industry. The presentation then list existing solutions for Infrastructure as a Service (IaaS) which are compatible or supported by SlapOS. It provides a list of already supported and planned storage for SlapOS. SlapOS itself can be used as a Platform as a Service (PaaS) to port existing applications to the Cloud. SlapOS already provides numerous software components and stacks. Components and stacks can be combined thanks to a simple API supported by REST/JSON protocol. Last, SlapOS Alpha Developer Program is introduced to help software componaies move to the Cloud in short time and deliver their software as SaaS or PaaS with a full subscription and billing platform solely based on Open Source Software.